A new analyst report sees Apple switching to higher powered charging for its next generation of iPhones, with new component suppliers possibly coming aboard. In a new research note provided to by AppleInsider, Jun Zhang of Rosenblatt Securities believes that Apple will upgrade from 5V 2A to 9V 2A and 5V 3A charging circuitry in its upcoming iPhone generation. Their interest in doing so is to "support more applications , provide a quicker recharge, and better compete with Android OEMs." 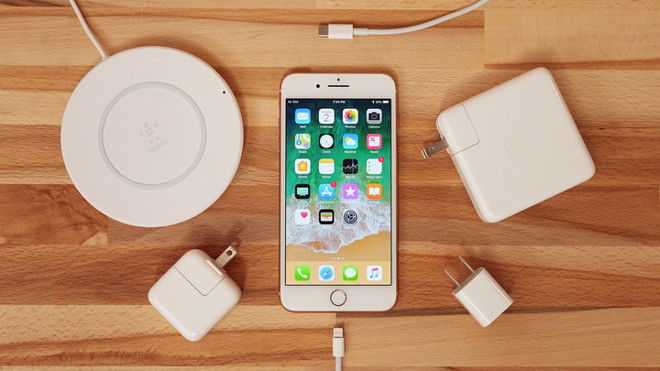 Apple will accomplish this, according to Zhang, by using Power Integrations as the lone supplier for its fast-charging chipsets, while using Flextronics and Artesyn for its upcoming iPad Pro and iPhones. The note also suggests that, after Power Integrations fixed a quality issue, that company will replace ON Semiconductor and NXP Semiconductors as "the main provider for the charging solution for all new iPhone and iPads." The report also suggested that, for its wireless charging technology for the new LCD model, Apple will replace Broadcom with Texas Instruments, in order to reduce charging costs. Overall, Zhang predicts that iPhone production will show annual growth in the second half of the year, as three new iPhone models arrive, with 100-100 new units produced and 85 million shipped. LCD iPhone model production as seen as higher than the other two models combined. And Hon Hai Precision is predicted to begin production a month earlier than previously expected. Fast-charging debuted in the iPhone 8 and iPhone 8 Plus. Zhang predicted last month, in another note, that Apple may bring back the iPhone 5c-era color schemes for its next flagship iPhone.